Liberation Days – Documentary Mentorship — Watershed Productions Inc.
Seneca the Roman Philosopher said “While we teach, we learn.” That expresses one of the main reasons I teach: to learn. The latest mentorship venture is particularly unique. 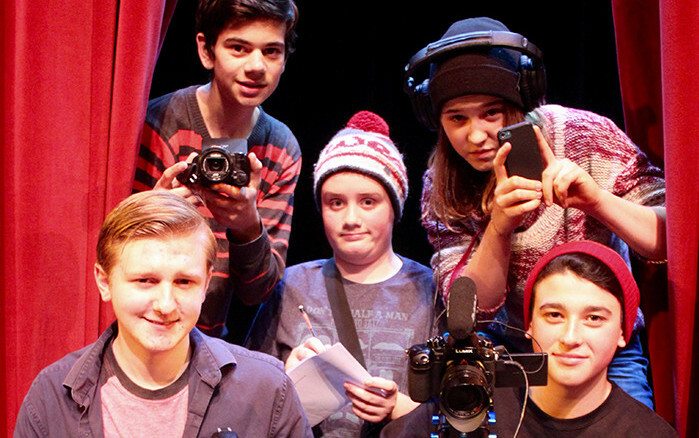 I am working with five high school aged youth to produce a “Behind the Scenes” documentary of the upcoming Capitol Theatre production entitled “Liberation Days” written by Canadian playwright David van Belle. Pat Henman, Director of the Nelson based production, explains that the play, which highlights Canada’s role in the Netherlands six months after World War II, is “really about humanity.” Following this theme in our interviews with the cast, which includes local veterans Geoff Burns, Michael Graham, and Lindsay Clague, we want to dig further into how this play may relate to our shared experience of being human across cultures and other lines that sometimes divide people. Liberation Days will be hitting the stage on Thursday March 3rd for a run of 4 shows at the Capitol Theatre in Nelson. I can tell you that from our perspective, ‘behind the scenes’, it’s a must see for any arts lover around. Posted on January 18, 2016	in Events. Bookmark the permalink.